Space solar power advocates may soon get their day in the sun, asdifferent projects aimed at beaming energy to Earth from orbit begin to takeshape. But at least one space power scientist worries that a U.S.-based project may bepromising too much, too soon. Last week, California regulators proposed a plan to approve a 15-yearcontract with the American company Solaren Corp. to supply space-basedsolar power to utility giant Pacific Gas & Electric (PG&E) by 2016.The Japan Aerospace Exploration Agency (JAXA) has also teamed up with a privateJapanese coalition to design a solar space station for launch by the 2030s. Such projects encourage scientists who dream of harnessingthe sun's power directly, without the interruption of cloudy skies andEarth's day-night cycle. 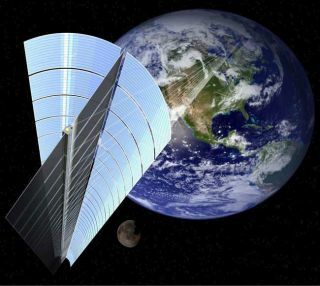 Marty Hoffert, a physicist at New York University and oneof the staunchest supporters of space solar power, suggests that today'stechnologies allow space solar power to provide energy as cheaply as the usualsolar panel arrays on Earth. "The problem is that we're treating space solar power as somethingthat has to compete with coal right now," said Hoffert, who gave a recenttalk on beamed power at the New Jersey Institute of Technology. "Nothingcan compete with coal." Despite his enthusiasm, Hoffert remains skeptical of Solaren's plan. Andhe warns that failure to deliver could deal a life-threatening blow to thedream of space solar power. A decision by the California Power Utility Commission on Solaren?s planfor PG&E could come as early as Thursday, according to a Dow Jones wire report. Solar panels in space can receive seven times more solar energy per unitthan ones on Earth and don't have to deal with weather or darkness. Thechallenge in harnessing that energy comes from the expensive costs of launchingmaterial into space, as well as figuring out how to beam energy back down toEarth. Microwave beaming has long been the favored delivery option for spacesolar power advocates. Space power stations using this method would convert theelectricity generated by solar panels into radio frequency (RF) waves forbeaming down to an Earth receiver several kilometers wide. A former NASA scientist demonstrated the RF concept last year by beaming20 watts between two Hawaiian islands ? barely enough energy to power a dimlight bulb. That experiment cost just $1 million. A full-scale space solarpower setup would require much bigger and more costly receivers. Another more recent choice has arisen in the form of solid-state lasers.Such lasers now have enough power to deliver energy as a tightly focusedoptical beam that requires much less costly equipment in space and on theground. But unlike RF, lasers can run into bigger problems with atmosphericinterference and weather. "Microwaves can beam through clouds, which lasers can't,"Hoffert explained. "With lasers you're going to have to have receivers indesert sites that are cloud free, and maybe backup receivers in several sites." Hoffert still favors lasers because of the lower costs required up frontfor a tech demonstration. By contrast, Solaren weighed its choices and decidedto go with RF technology. "Basically we chose RF because it is more efficient and hasall-weather capability for the reliable delivery of electricity to our customers,"said Cal Boerman, Solaren's director of energy services. Hoffert is wary of Solaren's latest step forward and the company's promiseof delivering 200 megawatts to PG&E utility customers in California by2016. Hoffert estimates that Solaren could manage to get about 50 percenttransmission efficiency in a best-case scenario, meaning that half of theenergy collected by space solar panels would be lost in the transfer down toEarth. Solaren would then need to launch a solar panel array capable ofgenerating 400 megawatts. The total launch weight of all the equipment would bethe equivalent of about 400 metric tons, or 20 shuttle-sized launches, accordingto Hoffert. But Solaren says that it would just require four or five heavy-liftrocket launches capable of carrying 25 metric tons, or about one fourth ofHoffert's weight estimate. The company is relying on developing more efficient photovoltaictechnology for the solar panels, as well as mirrors that help focussunlight. "Solaren?s patented SSP [space solar power] system dramaticallyreduces the SSP space segment mass compared to previous concepts," Boermantold SPACE.com. Solaren has not provided details on just how its technology works,citing intellectual property concerns. But it expects that its space solarpower can convert to RF energy with greater than 80 percent efficiency, andexpects similar conversion efficiency for converting the RF energy back to DCelectricity on the ground in California. The company also anticipates minimaltransmission losses from the space to the ground. Hoffert remains unconvinced without knowing the details of Solaren'stechnology. He frets that "premature optimism" over unproven andperhaps scientifically implausible concepts could end up ruining the reputationof space solar power, even as advocates desperately want to see their visioncome true. "Too many space power guys have been silent, perhaps to not givecomfort to opponents," Hoffert noted in a recent e-mail to colleagues. "Butscientists should not do this." Hoffert still believes strongly in the promise of space solar power, andhas calculated that it can even prove as cost-effective as ground-based solarpanels. That's because solar farms on Earth must build expensive storagesystems to hold energy reserves during cloudy days or nighttime ? althoughHoffert still sees solar farms as an ideal complement to space solar power. Space solar power has to deal mainly with expensive launch costs ofabout $15,000 per kilogram, as well as the huge capital costs of buildingground arrays if RF technology is involved. Hoffert has pushed for the laserbeaming approach as newly effective cost-cutting measure, and even submitted aproposal with his son to ARPA-E, the U.S. Department of Energy's new agency. "The cost to first power doesn't have to be in the hundreds ofbillions," Hoffert said. His proposal includes laser transmission tests onthe ground in an NYU lab, and then a space experiment launched to theInternational Space Station. Such beaming tests could even provide temporary power to isolated placeson Earth along the space station's ground track, although a true solar spacepower station would sit in geostationary orbit. Hoffert approved of Japan's own space solar power effort, ledby JAXA, which would test both RF technology and lasers as means of energytransmission. He envisions the possibility of space solar power becomingcommercially viable within a decade ? but only if all the science bears out thetechnology behind private efforts. "Some of it is physics and engineering, and some of it is businessand promotion," Hoffert said. "But in the long run, you can't foolMother Nature."